One thing my husband, Jim, and I have in common is a love for cars. I grew up a city girl with a country dad and remember working with him on his old Buick and dreaming about opening a mechanic’s shop just for women when I got older. I ended up becoming a university professor instead, but I never lost my passion. Jim and I had always wanted a vintage vehicle, but timing, opportunity and priorities played interference over the years. But at long last, we decided to bring our dream to life. We’d just sent our last kid off to college, and after getting over the shock of being empty nesters, we decided it was finally the perfect time. Being familiar with its automotive renown, Jim and I started our search in Bowling Green. Not only did we find a handful of strong contenders to purchase, we found activities and events to turn the trek into a vacation. 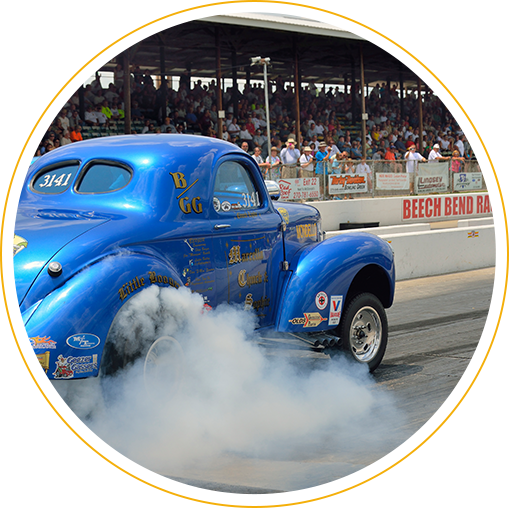 We wanted to experience the whole hot rod playground that is Bowling Green: from automotive history, to whipping around a track at top speeds, to watching the pros in action. 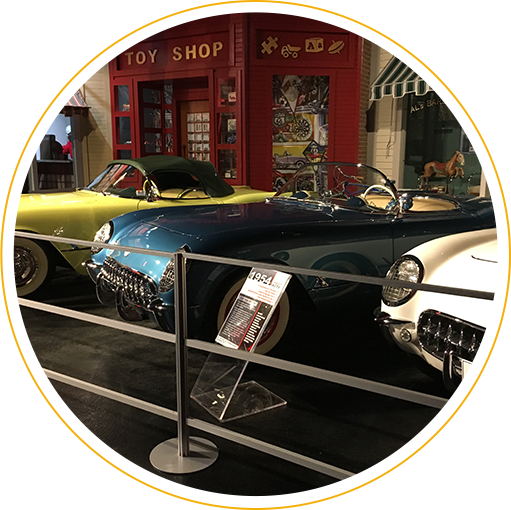 With our wishlist in mind, we centered our trip around the Corvette museum and the Danchuk Tri-Five Nationals. Driving to Bowling Green through Louisville and through the beautiful lushness of the Kentucky landscape was a joy. As we got closer, our excitement was off the charts. Our soundtrack for the trip included mostly songs about cars. We had a ball singing along and getting excited about what was around the next turn. 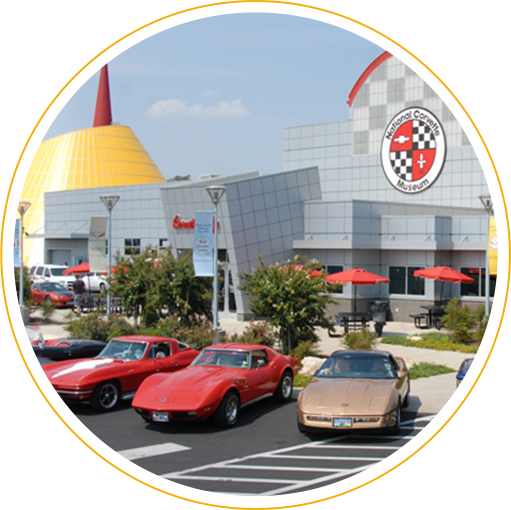 We knew we had arrived at the National Corvette Museum when we saw the yellow dome and red needle next to the shiny silver building. I don’t think I’d ever seen so many Corvettes in one parking lot before. Inside, there were wonderful stories about each car and many had photos of the owners. There was a lot of great history not only about the Corvette, but how it fit into the landscape of the American automobile. Did you know that the name Corvette came from a type of small warship? We’d reserved Hot Lap ride tickets at the museum’s NCM Motorsports Park. We rode in a Corvette Z06—one of the most powerful Corvettes— with a professional driver for two laps on the Grand Full Course at speeds only professionals should drive. Let me be honest, I was initially anxious. As soon as I strapped on my helmet and was belted into the car, it occurred to me that maybe, it was going to be too ‘hot’ for me. It turned out to be magical. My knees were shaking for days, but the thrill was well worth it. At high-speed turns, the centrifugal force pressed into me with the persuasion of a mighty ocean wave. We were all cracking up when my driver recounted my “colorful language” to Jim. At Jim’s turn, he never let on to being nervous. Though I couldn’t see beneath his helmet, I imagine he was beaming during every moment of it. Jim wasn’t done with velocity after the Hot Lap. He opted to ride a go-cart at the new NCM Kartplex where he got to race against other drivers. My wobbly legs and I chose to play videographer to share the experience with the kids. Jim got his helmet on and loaded into his high-speed go-cart. 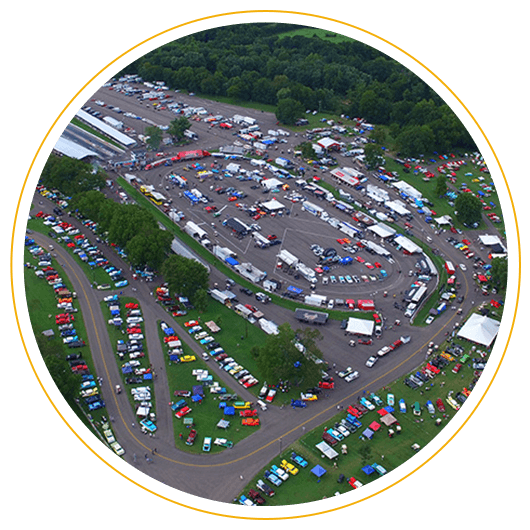 The course was bordered by tires, and from track maps, it looked like a PAC-MAN grid. 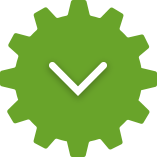 Without hesitation, Jim rocketed forward when the moment came. He was a natural. I wondered if he’d been practicing around the neighborhood at home. 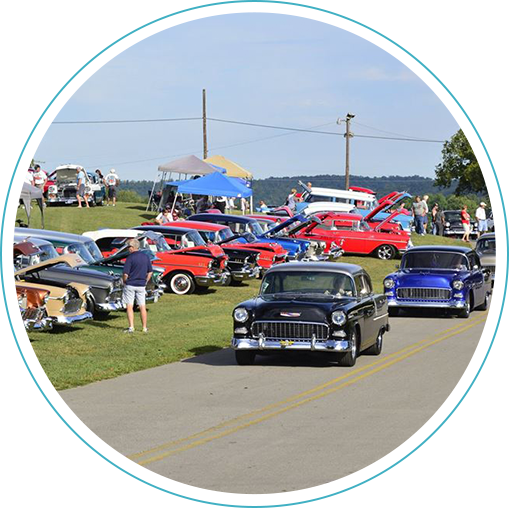 After the museum, we headed to Beech Bend Raceway, the site of major events like the Holley LS Fest, a celebration of GM LS engines that debuted in the 1997 C5 Corvette, and the Tri-Five Nationals. It was the Tri-Five weekend highlighting 1955–1957 Chevrolets. The cars ranged from classic restorations to super-swank street rods. The smell of burning rubber and the sound of screeching tires was exhilarating. I’m not sure who was more excited, Jim or me. We both had silly crocodile grins on our faces. As far as favorite racers go, we both loved the Bel-Air. Picture polished retro baby blue paint, a gleaming chrome grill, wide headlights like happy eyes, and white-walled tires reminiscent of Billy Joel’s “It’s Still Rock and Roll to Me.” Now imagine it as a beautiful blur speeding across the track. The seating at the course was unbelievably close to the action and provided a perfect view of the races. Jim shared a tidbit he’d picked up, saying they literally don’t make them like this anymore. Beech Bend is one of the longest continually operating raceways in the country, and at the time of its construction, stadium seating was built closer to the track than these days. We could feel the wind from the cars. We spent most of the next day shopping. By late afternoon, we bought my dream car—a 1964 Daytona Blue Corvette Coupe! It purred as I drove it off the lot. We stopped in downtown Fountain Square at the Corsair Distillery for a tour and to celebrate our new “baby” with a bourbon toast. So much for being empty nesters. Though we went to Bowling Green to explore cars, the Corsair Distillery, billed as “booze for badasses,” was a definite standout. It’s a small-batch distillery making exceptional product, and is an official stop on the Kentucky Bourbon Trail Craft Tour®. The inside featured warm amber hues decorated with bourbon barrels in every room. The company is young and the vibe was equally youthful and fun. We took home bottles of the Corsair Triple Smoke and the Ryemageddon. Once we got home and tucked in the coupe for the night, Jim and I started planning our return excursion. In addition to the Corvette Experience where visitors can drive a track Corvette, another aspect of the Motorsports Park Jim reminded me of was the High Performance Drivers Introduction (HPDI)—a course that teaches recreational performance driving, in which we’d drive our own car. I was trying to be nonchalant when Jim reminded me of that, but he said I was coming across more like a kid eager for a birthday. I guess that means we’re taking yet another baby off to school. Rev your engine in Bowling Green.